Hosni Mubarak has just used the last tool in his tool box in a desperate attempt to cling to power. First, like all dictators, he attempted to use the security forces most loyal to him – the special police and security forces – to intimidate and disperse the protestors. Through tear gas, rubber bullets and live ammunition, the protestors stayed. Next, Mubarak sent out the Army. The protestors had prepared for this and embraced the army with a “hug a soldier” strategy that eventually won a pledge from the army to not stop the protests. When the use of formal violence did not work, Mubarak tried carrots. He appointed a new government and vice president and promised not to run in the next elections, but the former only affirmed that he was capable of doing whatever he wanted to do and the latter would allow him to set the terms of that election and potentially retain power informally through the NDP. So the protestors stayed and the world watched and waited for Mubarak to crack. Now we get the last gasp of desperate regimes: the use of thugs and violence outside of the formal levers of power to sow chaos. The key here is that the power that the nonviolent activists have exercised in recent days cleared away the fear that had characterized Egyptian society for three decades. Without such fear, the corruption and violence of authoritarian governments can no longer function. But Mubarak has calculated that if he cannot retain power based on the fear the Egyptian people once felt toward him, he will at least take away the power the protestors have created by making them scared of their fellow citizens. Indeed, employing his baltageya is a tactic with which Egyptians are all too familiar. Unfortunately, this final strategy of Mubarak has met with some success, or at least the sort of perverse “success” that dictators like Mubarak rely upon. This is partly due to an unfortunate inability of some reporters to distinguish the players here (Facilitated by the fact that the press was directly targeted by the thugs as well, forcing many reporters to flee). Headlines such as “Protests Turn Violent” and “Violence in Cairo” portray the events in a way that the casual observer might think that all sides are instigating violence, or that the protestors became so frustrated that they gave up nonviolent means. Instead, even in the face of violence today there were reports of the anti-government protestors maintaining discipline and chanting “peacefully, peacefully.” But they also broke on occasion, despite a valiant effort ot maintain nonviolence, either defending themselves from the thugs who descended on Tahrir or, in some cases, attacking those who had attacked them. This was a major victory for Mubarak, especially in his attempt to hang on to the military. Past nonviolent movements would suggest that there are two crucial things for the anti-government protestors to keep in mind. First, the organizers must find a way to creatively channel the anger and fear that their fellow protestors felt in the assault today. Doing so may be difficult and it may require new and innovative strategies. Even at this late stage this is not impossible, because NBC and other outlets are reporting that amidst the chaos of the last day the organizers are still finding ways to effectively communicate with people in the city and the Square. Second, they must be sympathetic to the military and work hard to communicate with them. The ordinary soldiers in Tahrir Square are under extraordinary psychological pressure being caught between their duty to the people of Egypt, orders they are receiving from commanders and pro-Mubarak thugs. Although the organizers have pledged to continue protests until Mubarak falls, from a strategic standpoint and a practical standpoint they simply cannot lose the support of the military that they worked so hard to win. Both Gandhi and Dr. King were very keen to stop protesting and have cool down periods. In Dr. King’s case, this was sometimes with the explicit purpose of not forcing the National Guard to have to act, but instead avoiding bloodshed by delaying a protest until another day. It may or may not be time for this in this case, but what is certain is that in order to maintain control of the narrative, the protestors now need to show that they can let the regime overplay its hand without being drawn into the vortex of violence that is its only hope for survival. Wow. This is a spin that is bordering on outright dishonesty. 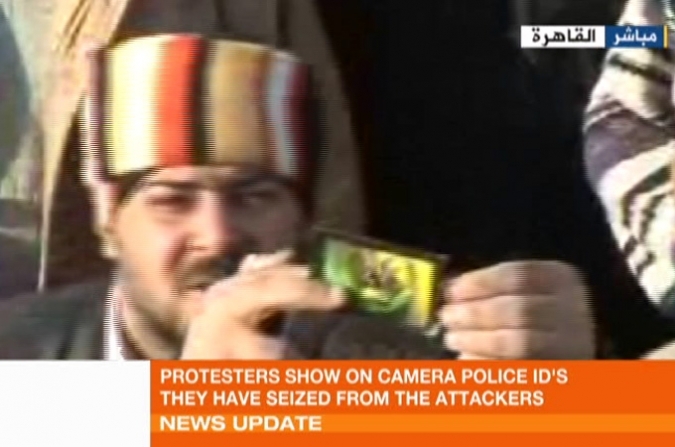 I’ve been looking at the pictures and watching Al-Jazeera live coverage. I have seen hundreds of people bravely FIGHTING. Thousands of stones and bricks in the streets, picked up and thrown again and again. Last night watching the two sides throwing molotov cocktails at each other for hours. Have you seen the pictures of the mauled APCs? The burned buildings? The injured protesters AND police? Here, see for yourself images of the violence dating back to Jan. 26. In these precious moments where history is made, this crass attempt at real-time revisionism, writing people out of their own history, is most disappointing. Part of the pathology of pacifism I suppose. Matt, I think you have missed the point of the article. I do not believe that the article aims to ignore the violence that has occurred, but rather to highlight successful uses of non-violent means of protest that have been successful despite relentless efforts by Mubarak to thwart the peaceful efforts. It further attempts to look at aspects of historical examples of successful non-violent protest, and to conjecture on what methods may be successful in keeping the non-violent protestors non-violent and perhaps in the best case re-direct some protestors who have not been so disciplined in the face of assaults upon them. Please define this pathology of pacifism that you speak of. Do you think compares with the pathology of violence? So after days of fighting, defeating the police force, the protesters desired an end to it. Good. I am not trying to say that the protesters desired violence, nor do I believe they instigated the violence. I agree with the article’s claim that the government initiated the violence beginning with the police and later on instigated yet more violence with thugs and goons. What I do not agree with is the article’s attempt to present the protesters as “non-violent protesters” as understood by us in the west in the tradition of MLK and Ghandi. These people were quite clearly prepared to respond to violence with violence. The Muslim Brotherhood states that it is a non-violent organization, but that should be not confused with being a pacifist organization. They have renounced violent activities such as bombings, assassinations, executions and the principle of jihad, and have tried to work within a democratic process, although some question how committed they are to that. I do not see that they have made any commitment to pacifist principles. But here we have a pacifist in the west trying to make them one of his own, trying to fit them into his own narrative, against all evidence. The Pathology of Pacifism is a famous and controversial work by Ward Churchill. It should be reviewed any time someone invokes MLK and Ghandi in the creation of revisionist narratives. Thanks for the comments Erin and Matt. At any rate, it seems clear that the organizers are familiar with the theory and practice of nonviolence, as organizers of the Egyptian Movement for Change (or Kefaya) have been at the center of this. We also have copies of the literature that has been circulating at The Atlantic that details such strategies, as well as accounts of the “hug a soldier” idea I mentioned, which is right out of Gene Sharp’s playbook. This of course does not mean that Mubarak’s tactics of provoking the protestors into violence has not worked, nor does it mean that the organizers, let alone the diverse group of protestors, are strictly adhering to nonviolence. But this was not conceived as an armed uprising and, despite the crack down, the protestors have not (yet) decided to change their tactics in the main to violence. As for Churchill, that’s a longer discussion. But suffice it to say, I appreciate you reminding our readers that it is not just right wing types that are enamored with the idea that violence is necessary and just. I do not dispute this statement, but if you change one word – “violence” – to “active resistance,” one could make a strong case that “in the main” protesters were prepared to engage in active resistance. I salute the brave protesters and resisters, both passive and active. In these events we can observe the results of both types of resistance, and learn, if we are objective and set preconceived notions aside. The subject of tactics will be a never-ending source of debate. What is appropriate in one time and place is not necessarily appropriate in another. Egyptians were fortunate that the police and army did not gun them down. In Bahrain, not so fortunate. Still, world opinion and financial investors may sway it. On the other hand the financial investors are more concerned about the riots that are following on the heels of the above. The Libyan gov seems to be going down quickly in the face of a determined show of force. Of course it is not necessarily in their best interests to destroy these buildings and banks. But it is perhaps necessary to occasionally remind tyrants that when push comes to shove the people have the power. I’m not one of those pacifists who thinks that violence can never achieve the political goals it sets out after. Indeed, I do not think that violence is always immoral. But I do think that the means one chooses has effects on the ends. I am a deeply saddened by the use of violence in Libya (and Morocco) by SOME of the protestors, though I am not surprised because of how little training people have had and because these protests have spread so widely so quickly that there is a great deal of free-riding going on. But it does not bode well for what kind of regime will follow in Libya, it gives license to the government to respond with further violence (as they did in an extraordinary and horrific fashion today) and it is tragic in its own right because those who have been killed or injured on all sides are human beings. There is much more to say, but the logic of your comments makes assumptions about the nature of power that are erroneous. I recommend you read a bit more about the theories of power that underlie strategic nonviolence. A good place to start, since his thought is having such a resurgence at the moment because of the use of his tactics by the protestors in Egypt, is the first volume of Gene Sharp’s The Politics of Nonviolent Action. Ok, I’ll read some Sharp, thanks for the suggestion. I *am* grateful that in the USA we still have so many options other than violence available to us. I have commented in a few places before that if a majority of the American people really want the government out of Iraq and Afghanistan, as polls claim, we could accomplish it in a few days. We wouldn’t have to protest, or sit-in, or do anything… just stay home from work and relax, go for a walk, spend some time with friends and family. The government would have to quickly capitulate. Perhaps people are afraid to realize the power they have. They would then have to take responsibility for it.